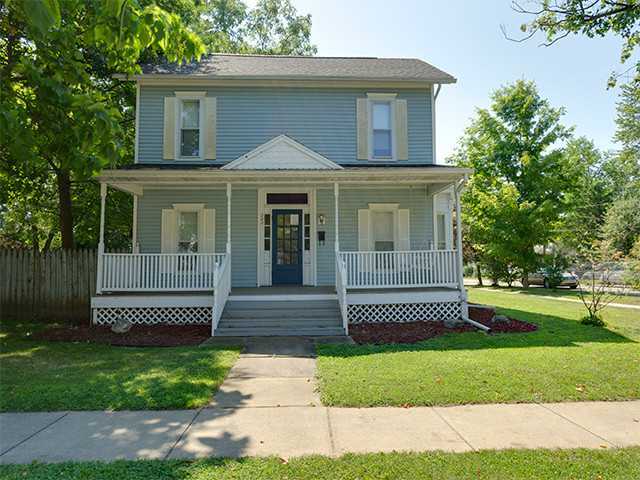 Located in Eaton Rapid’s most desirable neighborhood, this immaculate 2 story turn of the century home has lots of character and charm. Home features stunning kitchen with stainless steel fridge, ample amounts of counter space and wood cabinetry allowing for lots of storage. Formal dining room is large enough for all family gatherings. Family room features a gas fireplace, very cozy! Home also has a separate living room and first floor laundry. With over 2000 sqft of living space there is plenty of room. All 3 bedrooms are on the second level, including a large master. Master has huge closest and new hardwood flooring. Home features 2 full baths, one on each level. This stately home has been well cared for and features many updates, including newer siding, new roof, new water heater, Morton water softer, and high efficiency furnace. 2 car garage features finished loft space with pellet stove, currently being used as an office. Yard is fenced in and features mature trees. For additional information on this property click here! Posted on August 27, 2013, in All Other Listings. Bookmark the permalink. Leave a comment.